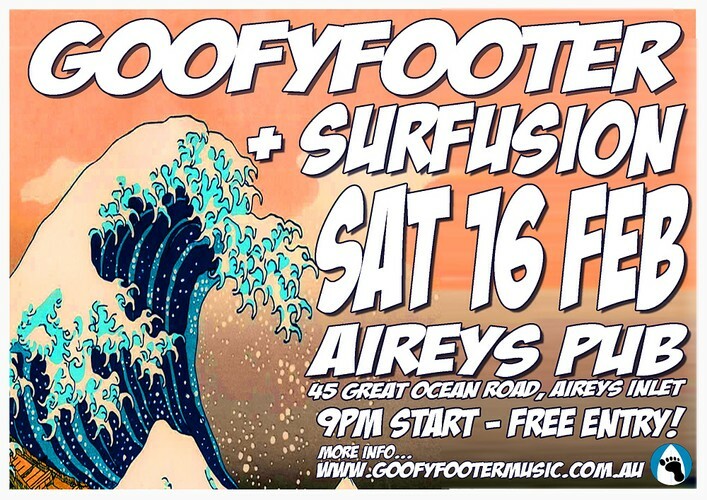 The future of Surf Rock music slams into the Aireys Pub with a massive double-header, TWO awesome bands! This isn't traditional twangy surf music from the early 60s, it's Aussie pub rock at it's very best. Not to be missed! "The name Goofyfooter suggests…well, it suggests surfing. So naturally (no pun intended) if you’re expecting some sort of beach boys cover band then you had better keep on expecting. Goofyfooter are not your everyday surf-rock band, they are a strange eclectic fusion with plenty of awesome mixed in." "If having released sixteen albums is called the beginning then you had better strap yourself in for a long, cruisey ride with earthy songman Red Whyte. But this is how the singer-songwriter and multi-instrumentalist sees it. For this muso and avid surfer there are three playgrounds in life: the surf, the studio and the stage."